You may recall me mentioning Mary from Book'em Mysteries. She and her hubby Barry have hosted me at every one of my South Pasadena Arts Crawl marbling demos. Mary is an absolute gem of a lady. Calm and reassuring, yet a dry (and wicked) sense of humor. She is a retired school teacher so you can, of course, see where both of these attributes were strongly developed. I always give Mary, a fan of my work, something marbled as a thank you for being a generous and gracious Arts Crawl host. I do, after all, come into her store, move displays around, and make her stay until 10 p.m. (way past her bedtime) on those nights. It's the least I can do. The first time I gave her a framed marbled hummingbird. Another time, she chose some marbled boxes. And yet another time, my cards. This last Arts Crawl, I asked Mary what kind of thank-you gift I could give her...I was starting to feel guilty about forcing my work upon her...when she said, "There's one thing I would like." "Talk to me," I said. "Name it and it's yours." She told me her son sang with orchestras all over the world and most recently worked with the Royal Philharmonic Orchestra on the premier of "What The World Needs Now...The Music of Burt Bacharach," which he conducted and co-produced. "Could you the marble sheet music so I could frame it and give it to him for Christmas?" she asked. 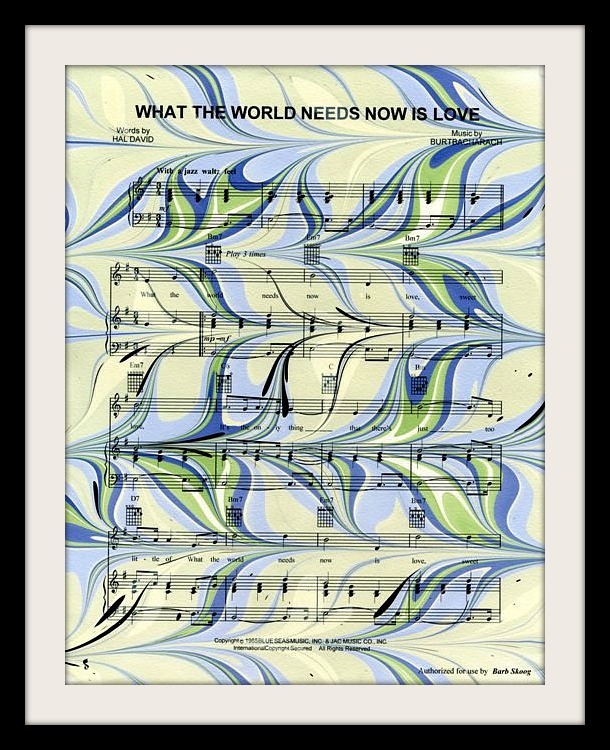 We talked color a bit and I set to work this past weekend marbling various patterns and designs on the sheet music to "What the World Needs Now is Love." It's a great song...it really is...until you end up singing it over and over again in your head all weekend long. On Sunday, I brought Mary six very different versions of the marbled sheet music and she picked out her favorite (which also happened to be my favorite). I then matted and signed it for her. And now it's on its way to London. I hope her son likes it as much as we do!